1 Bdrm 1st flr Flat. Hall. Lounge/Dining rm. Kitch. Bdrm. Bathrm (CT band - B). Price over £105,000 Entry by arr. Viewing contact solicitors. (EPC band - E). Accommodation: Entrance Hallway, Lounge/Dining Room, Kitchen, Double Bedroom, Bathroom with Shower. Double Glazing. Gas Central Heating. Security Entry System. On Street Parking. Share of Cupboard on the Half Landing. This SPACIOUS & BRIGHT ONE BEDROOM FLAT is located on the first floor of a traditional granite building in the heart of the city centre. The accommodation which is decorated in neutral tones boasts hardwood finishing’s and high ceilings throughout. The spacious lounge is bright and airy with a feature open fireplace and a bay window which overlooks over the corner of the street, providing an excellent dining area. 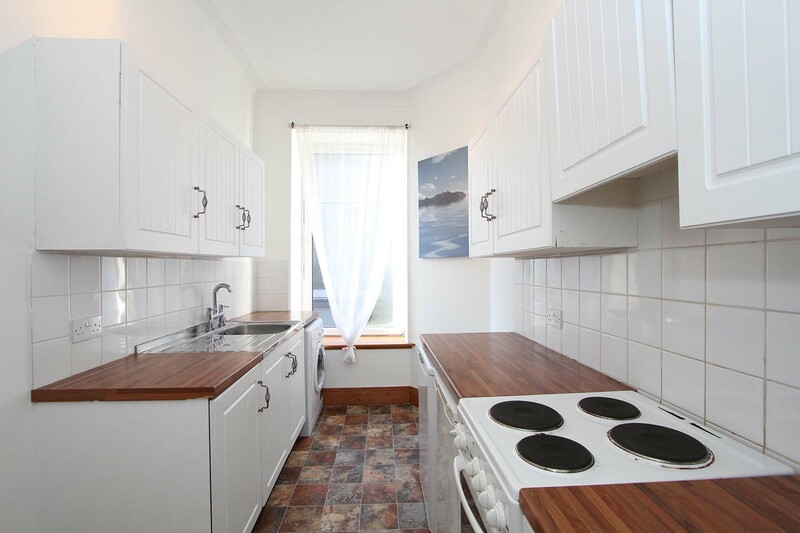 The kitchen is well fitted with a range of white units, contrasting worktops and appliances. 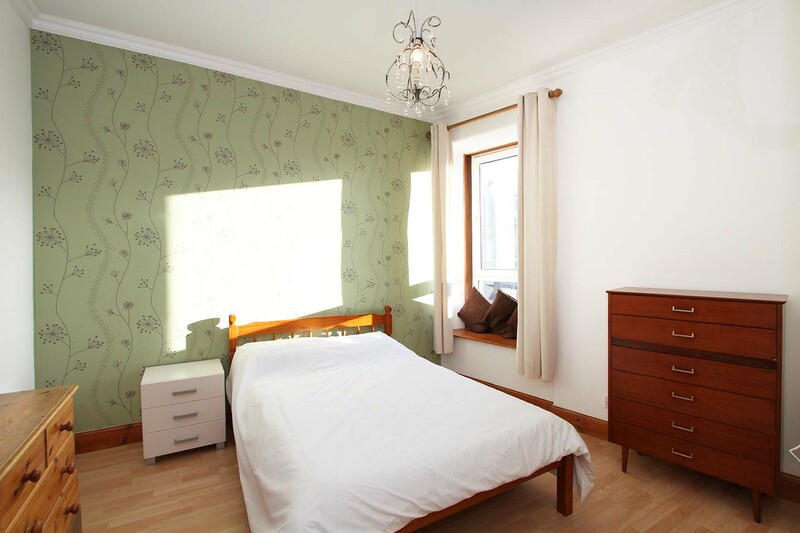 The particularly spacious double bedroom is to the front and has ample space for free standing furniture. 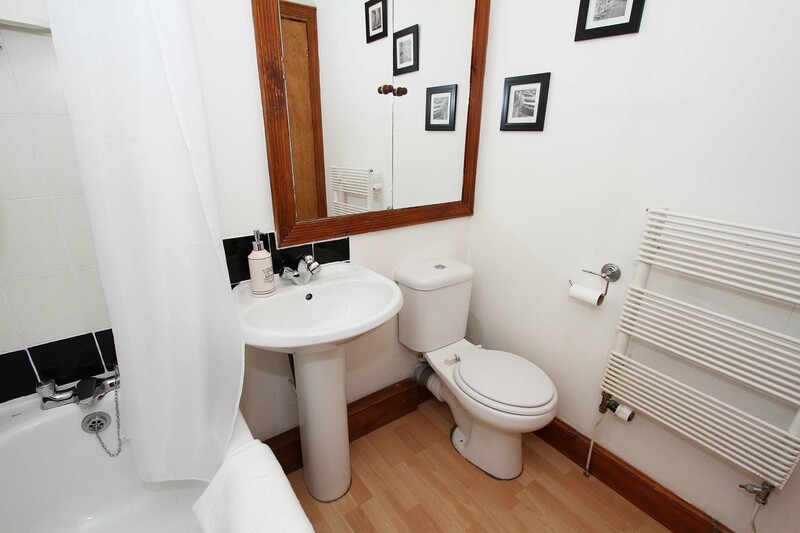 Completing the accommodation is the well appointed bathroom with shower over the bath. A share of the cupboard on the half landing provides additional storage space. Outside there is on street parking to the front. The property benefits from gas central heating, double glazing and is protected by a security entry system. All floor coverings, blinds and light fittings are included in the sale price together with the white goods in the kitchen. The furniture will also be included in the sale price making this a ready to move into home or ideal ‘buy to let’ opportunity. Langstane Place is located in the heart of the city centre within walking distance of Union Street and its many amenities. Public transport is plentiful in the area. Anderson Drive and the main dual carriageway north and south are easily accessible. 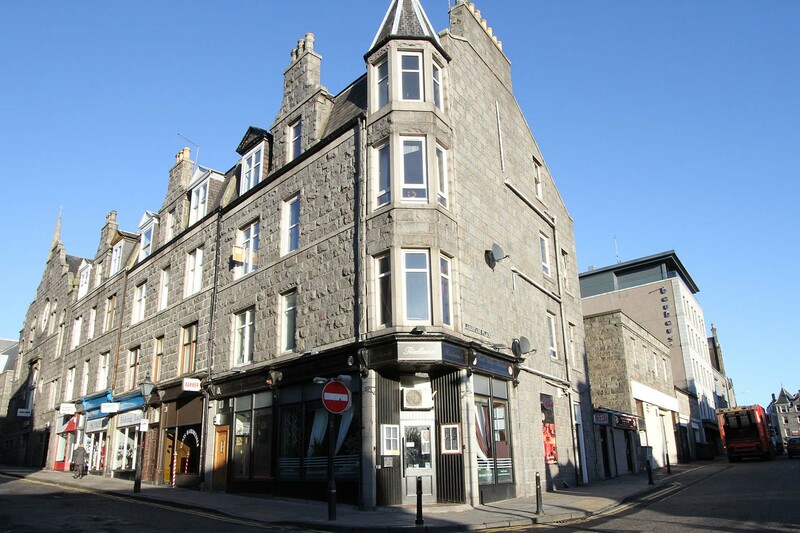 DIRECTIONS: To reach the property from the west end of Union Street exit into Bon Accord Terrace. Number 70 is located at the junction with Langstane Place on the left, clearly indicated by a Burnett and Reid ‘for sale’ sign. ENTRANCE HALL: Hardwood exterior door with glazed panel over. Security entry system. Telephone point. High level meter cupboard. High level storage cupboard. Smoke detector. Cornice. Laminate wood effect flooring. Light fitting. LOUNGE/DINING ROOM: 12’6’’ x 12’6’’ approx. Lovely bright room with bay window overlooking the corner of the street and providing a lovely dining area. Feature open fire place with decorative tiling inset and attractive marble hearth and mantel over. Ceiling rose. Cornice. TV point wired for Sky. Laminate wood effect flooring. Light fitting with dimmer switch. Radiator. KITCHEN: 12’5” x 6’8’’ approx. Large side facing window with deep sill flooding the room with natural light. Fitted with a range of white wall and base units incorporating contrasting worktops and stainless steel sink with mixer tap and drainer. Splashback tiling. Electric slot in cooker, fridge, freezer and automatic washing machine will remain. Cornice. Vinyl flooring. Light fitting. Radiator. DOUBLE BEDROOM: 12’3” x 11’5’’ approx. 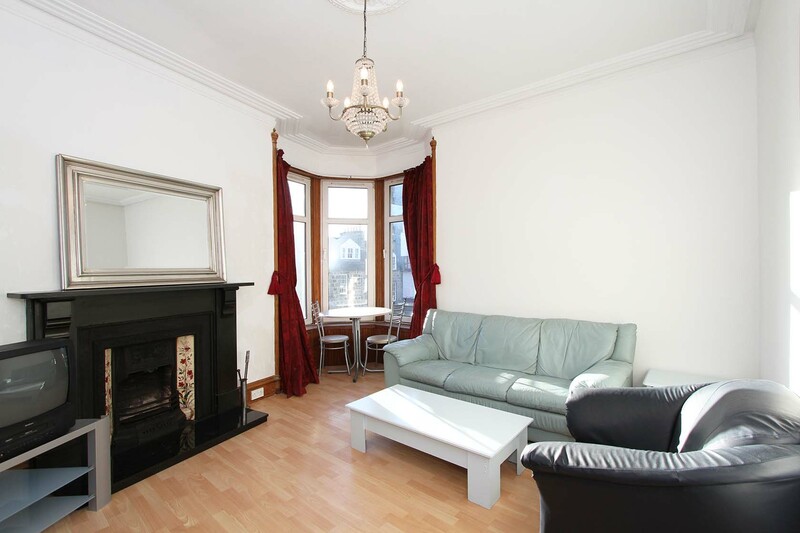 Spacious double bedroom with a large front facing window and deep sill. Ample space for free standing furniture. Cornice. Laminate wood effect flooring. Light fitting. Radiator. BATHROOM: Fitted with a white three piece suite comprising w.c., wash hand basin and bath with Mira shower over. Tiled around bath and shower area. Shower curtain and rail. Built in storage cupboard with mirror doors. Extractor fan. Laminate wood effect flooring. Light fitting. Heated towel rail. OUTSIDE: On street parking. Shared cupboard on half landing housing the central heating boiler.